an intellectual process, it becomes a gut reaction." It starts like this. An unidentified man purposefully crosses a road and enters the main building of a public swimming pool. There appears at first to be nobody inside. On reaching the pool itself, he circles its perimeter, checking changing cubicles as he goes. Is he looking for someone or checking for something? We don't know. He then heads back the way he came, but instead of leaving the building he takes a right turn and walks down a corridor. When he reaches his destination he pulls out a shotgun and coldly shoots dead a cleaner who is working there. He then tucks the gun into his coat and leaves. His pace does not change, he does not break into a run. Following his departure, the camera returns to the body of the dead cleaner and lingers on it for considerably longer than would be normal for a crime or action movie. To those coming completely fresh to Alan Clarke's penultimate film, Elephant, this must seem an intriguing set-up to a story in which reasons for what just happened will later become clear. In some ways it recalls the opening of John MacKenzie's The Long Good Friday, whose prologue was also set in Northern Ireland and which also featured an assassination whose narrative purpose at that point in the drama was a mystery (explanations would not be supplied until much later). Like the start of MacKenzie's film, there is no explanatory dialogue, but unlike that film there is no music either and the camera placement and cutting are also a little left-field, the use of wide shots and drifting Steadicam giving it a coldly observational feel. Only when the shooting occurs do we move in closer, and even then it is the gun that becomes the focus for the camera's attention, not the man who wields it. Facial close-ups are fleeting and we are not asked to identify with either the gunman or his victim, but merely to watch the terrible act that takes place. Even so, we still feel we are on reasonably safe ground. But then scene two kicks off. The camera patiently observes the shop at a petrol station from the far side of the road. A car pulls up and a man gets out, enters the shop and calmly shoots the the counter clerk. The gunman drives off unhurriedly – he even waits for a break in the traffic before pulling out – and the camera once again settles on the body of his victim, which it unwaveringly observes for close to twenty uncomfortably long seconds. By now most viewers would be starting to wonder. Again the approach is coldly observational, emphasised by a completely lack of dialogue or music. Are the two killings related? Is a more complex story unfolding? Scene three brings more of the same. 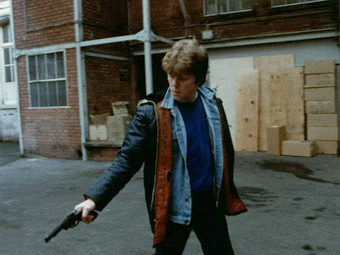 In a single Steadicam shot, another unidentified man walks down an alleyway and as he turns a corner a second man suddenly appears and shoots him. As the victim lies on the floor, the camera circles his body, into which further bullets are fired. His job complete, the assassin pockets the gun and walks away, taking the reverse route that delivered his victim to him. By now few will be under the impression that they are watching a standard drama. By the fifth or sixth killing the tone of the entire film has been set and the audience divisions set in, splitting those who are prepared to go where Clarke is taking them from those who are not. There is no plot, almost no dialogue and no musical score, just a series of eighteen sectarian assassinations, one after the other with no on-screen reasons given, no conclusions attempted and no characters shaped in any traditional sense. No-one is even identified by name. This is minimalist film-making at its most starkly pure and is bound to alienate a sizeable, dare I say more traditionalist portion of any potential audience. But stay the course and you will experience a film whose single-minded sense of purpose, bold rejection of traditional storytelling techniques and astonishing technical confidence mark it as one of of the most important films ever to be screened on British television, and for my money the very finest work of one of the country's most consistently excellent filmmakers. The project was originally the brainchild of producer Danny Boyle, later a director of some note himself (do we really need to mention Trainspotting and 28 Days Later? No, I thought not). Having landed a producer's job at BBC Northern Ireland, he became aware that many of the shootings taking place in the province were going unreported on the mainland, presumably because they involved ordinary citizens rather than politicians or others the English press deemed newsworthy. He was also a huge fan of Alan Clarke, and having written to him and been invited onto the set of Clarke's previous 'walking movie' Christine (1987), he hired him with this very project in mind and the two worked together to develop the film to its present form. The decision to shoot, so to speak, on the streets of Belfast was a brave one given that local people were living the reality of sectarian violence on a daily basis, but this not only adds to the documentary-like authenticity, it also provides some arresting locations – strangely empty streets, red brick industrial and municipal buildings and vast but deserted factories, all depressingly vacant symbols of Thatcherite industrial policy. The enigmatic title was inspired by Irish writer Bernard MacLaverty, who described the troubles in the province as akin to having an elephant in your living room – it is so enormous that no-one can ignore it and it gets in the way of everything you try to do, and yet no-one talks about it and after a while you just learn to live with it. A work whose content consists solely of a series of killings may seem a daunting prospect, but Clarke's camera style and editing structure makes it almost impossible to tear your eyes from the screen. As people walk, John Ward's mesmerisingly fluent wide-angle Steadicam goes with them, involving us in an almost complicitly intimate way with what unfolds. But with no character set-up we never know just who we are watching. Is this a gunman on his way to kill, as in the opening scene, or a victim unknowingly walking to his own death? As the film progresses, the process of pre-identification does not become any easier. In one memorable scene, a man walks onto a local football field and the presumption is that he is there to kill one of the players, but we are wrong-footed when he casually joins in a kick-about and wonder where the inevitable attack will come from. When it does happen it proves genuinely startling. Later on two men purposefully walk a considerable distance to what we assume will be the killing of a third person, but are again being misdirected and the truth delivers a horrifying jolt. All of which may make Elephant sound like it is creating grisly entertainment out of a serious issue, which could not be further from the truth. The killings are in no way glamorised and are observed with a matter-of-fact detachment that proves increasingly chilling. The sequential game-playing with identification of killer and victim also has purpose, reminding us repeatedly that in this situation just about anyone can be a killer – they don't wear horror masks or deformed leers to announce their presence – and equally just about anyone can become a victim. There are also no specific killing grounds and it can happen anywhere, on a street, in a back alley, in a restaurant, at work or even on your own home. We are never shielded from the effects of the murders, the camera repeatedly settling on the bodies of the victims in a way that is most appropriately disturbing. You can almost feel Clarke's hands on your head, pointing you towards them and saying, "Look. Look at what happens. Look at the result of all this bloody killing." Individual sequences are both astonishing in their handling and horrifying in their cold viciousness, and the cumulative effect is genuinely devastating. Elephant is not a film of separate sequences but the absolute sum of its parts – it has to be seen as a complete work, in one uninterrupted sitting. Even today, in times of peace accords and regional assemblies and open communication in Northern Ireland, it has the power to stun an audience to silence. Clarke has been widely acclaimed as one of Britain's finest directors, but Elephant strongly suggests that he was touched by genius. Given that the film was shot on high speed 16mm stock and that a very noticeable level of grain is to be expected (and is very evident in places), this is a very reasonable transfer. Although not pin-sharp in the mode of high-budget features, the level of detail here is still commendable and the contrast is generally first rate, with very solid black levels, especially evident in scenes shot at night. Colours are clear and never over-saturated, though in most scenes are deliberately toned down and drab. Dust spots are very rare and there are no scratches or other obvious blemishes. The Dolby 2.0 mono sound is clear and functional. As there is virtually no dialogue and no music, this is appropriate. The footsteps, incidental diegetic sounds and (especially) gunshots all register very effectively. 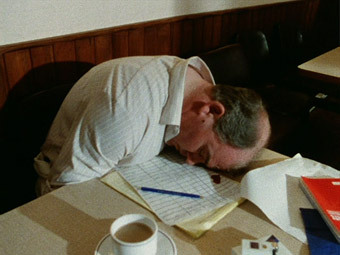 As part of Blue Underground's Alan Clarke Collection, Elephant shares disk space with Clarke's final work, The Firm, which is the only film in the set not to have much in the way of extras. At just 40 minutes, Elephant is the shortest film in the collection but still boasts an excellent extra in the shape of a commentary track by producer Danny Boyle and critic Mark Kermode. Both men are passionate about the film and Boyle is very effectively prompted by Kermode, resulting in a commentary without a single dead spot. Boyle supplies a wealth of information on the background and the shooting of the film, as well as his own memories of working with a man he still regards as the one of the greatest of all directors, and is most self-effacing about his own work by comparison. The commentary is at first not screen specific but in the later stages the two men increasingly discuss individual sequences as they play out, going into some detail on the use of locations and the level of accuracy in certain scenes. Boyle also reveals that Gus Vant Sant specifically asked him if he could use the title for his own film of the same name, a work who style, structure and some of whose key sequences were clearly influenced by Clarke's original. A second extra, Memories of Elephant is actually five minutes of extracts from the documentary Alan Clarke: His Own Man, made by Film Four to accompany a season of his films screened in 2000, and is comprised of short interviews with writer and broadcaster Howard Schumann, Clarke's daughter Molly, The Firm star Gary Oldman and writer/director David Hare. This compilation was originally screened immediately before Film Four's screening of Elephant in their Clarke season. When I first saw Elephant I was stunned and horrified by the content and wide-eyed with amazement at the technical handling. For me, this is Alan Clarke the film artist at the peak of his talent, a daring, experimental, confrontational, and emotionally overpowering piece, the best home-grown example I know of the sheer effectiveness of minimalist cinema at its most persuasively brilliant. It remains one of the best 40 minutes of television ever to air in the UK, but despite this I never, ever dreamed I would see it released on DVD, and yet here it is, and with a fine commentary track as an extra. For my money, this is the crowning glory of The Alan Clarke Collection, and of Clarke's extraordinary cinematic career. Blue Underground's Alan Clarke Collection contains the following films. Click on a title for a detailed review of that film.